StriVectin's Instant Revitalizing Mask is an intensely nourishing 15-minute facial mask that restores clarity and immediately illuminates the complexion. An effective dual-action complex of skin brighteners and Alpha Hydroxy Acids (AHAs) helps unify uneven skin tone and promotes a smoother, younger looking complexion. Patented NIA-114 technology strengthens the skin barrier as it hydrates and boosts the efficacy of the Alpha Hydroxy Acids (AHAs) to visibly renew and revitalize skin. An effective dual-action complex of skin brighteners works synergistically to help even skin tone. The way to use this is to apply a thin layer to the face and leave it on for 15 minutes or until it's dry. I've found that the mask does dry within the 15 minutes but I leave it on for the full amount of time. 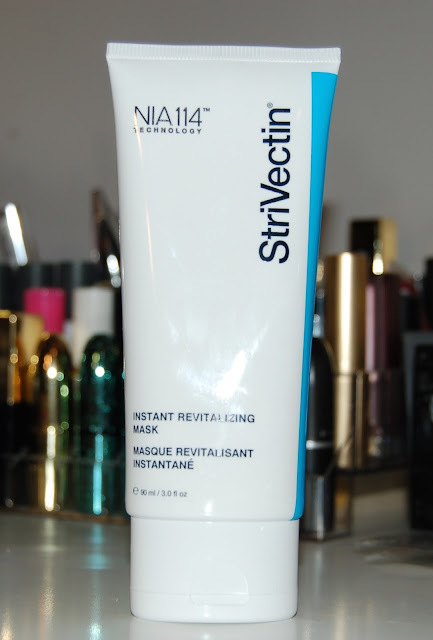 I really like the StriVectin Instant Revitalizing Face Mask! I noticed my face was brighter and radiant after using this face mask. My skin also felt more healthy, if that makes sense. This mask retails for $62 and can be purchased anywhere that StriVectin products are sold including the Strivectin website, Ulta, Macys, and Nordstrom.